New 2019 Camry LE with automatic transmission (STOCK# 190177, MSRP $25,568): LEASE OFFER: Lease for $276/month for 36 months, 10,000 miles/year. $276 first payment due at signing. $0 down payment. $220 doc & title prep, bank acq, title and registration fees included in monthly payments. No security deposit required. Sales tax additional. Lease end buy option $14,574. PRICE OFFER: $500 Customer Cash directly from Toyota. APR OFFER: 3.9% annual percentage rate financing for 60 months. $18.37 per month per $1000 borrowed. COLLEGE GRAD OFFER: Qualified buyers can save an additional $500. Visit toyotafinancial.com for program details. MILITARY REBATE OFFER: Qualified buyers can save an additional $500. Visit toyotafinancial.com for program details. ALL OFFERS: Cannot be combined with other offers. Available to well-qualified customers with Top Tier credit, not all will qualify. Offer ends 4/30/2019. 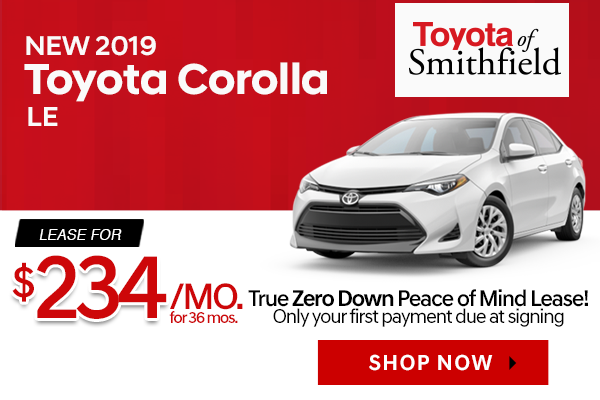 New 2019 Corolla LE with automatic transmission (STOCK# 190047, MSRP $20,055): LEASE OFFER: Lease for $234/month for 36 months, 10,000 miles/year. $234 first payment due at signing. $0 down payment. $220 doc & title prep, bank acq, title and registration fees included in monthly payments. No security deposit required. Sales tax additional. Lease end buy option $10,229. PRICE OFFER: $500 Customer Cash directly from Toyota. APR OFFER: 4.9% annual percentage rate financing for 72 months. $16.06 per month per $1000 borrowed. COLLEGE GRAD OFFER: Qualified buyers can save an additional $1000. Visit toyotafinancial.com for program details. MILITARY REBATE OFFER: Qualified buyers can save an additional $500. Visit toyotafinancial.com for program details. ALL OFFERS: Cannot be combined with other offers. Available to well-qualified customers with Top Tier credit, not all will qualify. Offer ends 4/30/2019. 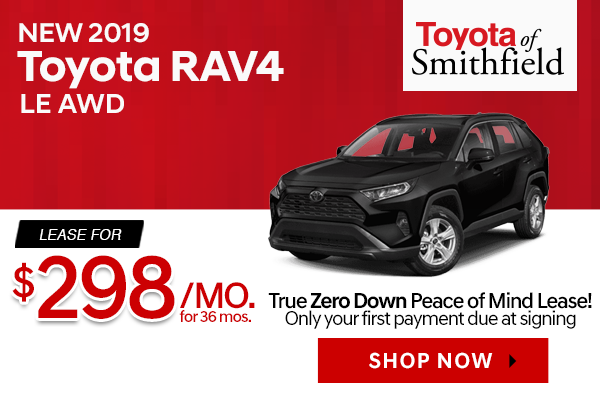 New 2019 RAV4 LE AWD with automatic transmission (STOCK# 190373, MSRP $28,494): LEASE OFFER: Lease for $298/month for 36 months, 10,000 miles/year. $298 first payment due at signing. $0 down payment. $220 doc & title prep, bank acq, title and registration fees included in monthly payments. No security deposit required. Sales tax additional. Lease end buy option $17,951. APR OFFER: 4.9% annual percentage rate financing for 72 months. $16.06 per month per $1000 borrowed. COLLEGE GRAD OFFER: Qualified buyers can save an additional $1000. Visit toyotafinancial.com for program details. MILITARY REBATE OFFER: Qualified buyers can save an additional $500. Visit toyotafinancial.com for program details. ALL OFFERS: Cannot be combined with other offers. Available to well-qualified customers with Top Tier credit, not all will qualify. Offer ends 4/30/2019. 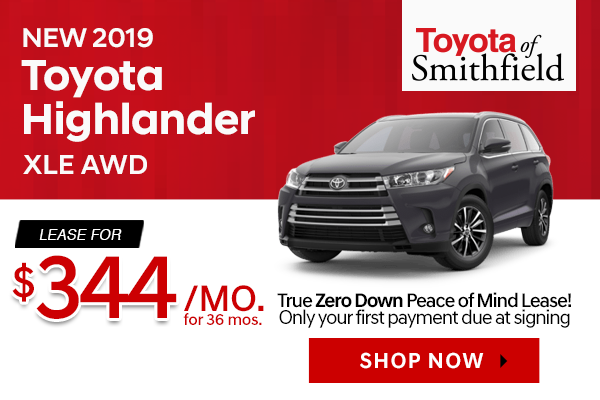 New 2019 Highlander LE AWD with automatic transmission (STOCK# 190229, MSRP $36,154): LEASE OFFER: Lease for $344/month for 36 months, 10,000 miles/year. $344 first payment due at signing. $0 down payment. $220 doc & title prep, bank acq, title and registration fees included in monthly payments. No security deposit required. Sales tax additional. Lease end buy option $23,501. PRICE OFFER: $1000 Customer Cash directly from Toyota. APR OFFER: 3.9% annual percentage rate financing for 60 months. $18.37 per month per $1000 borrowed. COLLEGE GRAD OFFER: Qualified buyers can save an additional $500. Visit toyotafinancial.com for program details. MILITARY REBATE OFFER: Qualified buyers can save an additional $500. Visit toyotafinancial.com for program details. ALL OFFERS: Cannot be combined with other offers. Available to well-qualified customers with Top Tier credit, not all will qualify. Offer ends 4/30/2019. 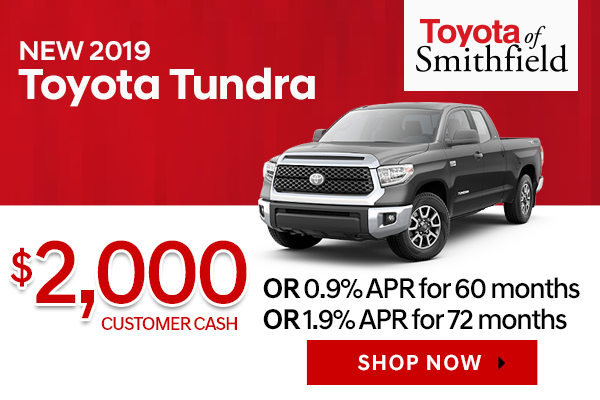 New 2019 Toyota Tundra PRICE OFFER: $2000 customer cash directly from Toyota. APR OFFER: 0.9% annual percentage rate financing for 60 months. $17.05 per month per $1000 borrowed. 1.9% annual percentage rate financing for 72 months. $14.71 per month per $1000 borrowed. COLLEGE GRAD OFFER: Qualified buyers can save an additional $500. Visit toyotafinancial.com for program details. MILITARY REBATE OFFER: Qualified buyers can save an additional $500. Visit toyotafinancial.com for program details. ALL OFFERS: Cannot be combined with other offers. Finance and lease offers available to well-qualified customers with Top Tier credit, not all will qualify. $220 doc & title prep applies to all offers. Offers end 4/30/2019. 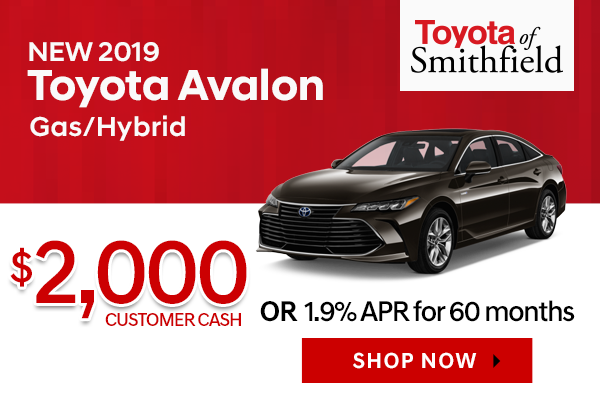 New 2019 Toyota Avalon and Avalon Hybrid PRICE OFFER: $2000 customer cash directly from Toyota. APR OFFER: 1.9% annual percentage rate financing for 60 months. $17.48 per month per $1000 borrowed. COLLEGE GRAD OFFER: Qualified buyers can save an additional $500. Visit toyotafinancial.com for program details. MILITARY REBATE OFFER: Qualified buyers can save an additional $500. Visit toyotafinancial.com for program details. ALL OFFERS: Cannot be combined with other offers. Finance and lease offers available to well-qualified customers with Top Tier credit, not all will qualify. $220 doc & title prep applies to all offers. Offers end 4/30/2019. 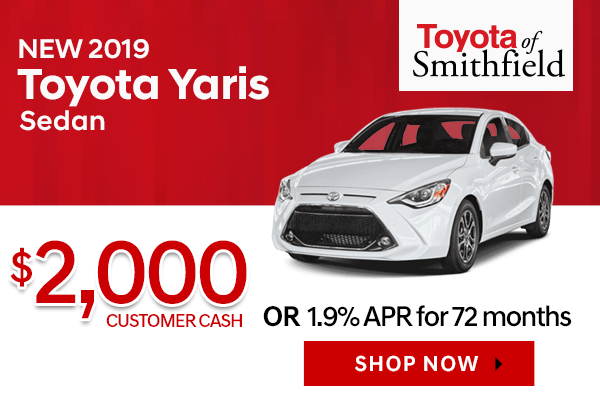 New 2019 Toyota Yaris Sedan PRICE OFFER: $2000 customer cash directly from Toyota. APR OFFER: 1.9% annual percentage rate financing for 72 months. $14.71 per month per $1000 borrowed. COLLEGE GRAD OFFER: Qualified buyers can save an additional $500. Visit toyotafinancial.com for program details. MILITARY REBATE OFFER: Qualified buyers can save an additional $500. Visit toyotafinancial.com for program details. ALL OFFERS: Cannot be combined with other offers. Finance and lease offers available to well-qualified customers with Top Tier credit, not all will qualify. $220 doc & title prep applies to all offers. Offers end 4/30/2019. 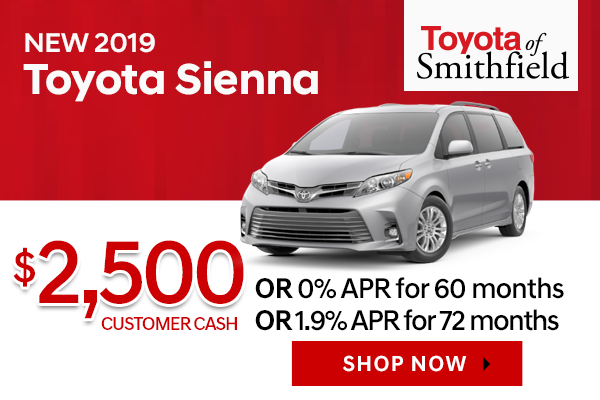 New 2019 Toyota Sienna PRICE OFFER: $2500 customer cash directly from Toyota. APR OFFER: 0% annual percentage rate financing for 60 months. $16.67 per month per $1000 borrowed. 1.9% annual percentage rate financing for 72 months. $14.71 per month per $1000 borrowed. COLLEGE GRAD OFFER: Qualified buyers can save an additional $500. Visit toyotafinancial.com for program details. MILITARY REBATE OFFER: Qualified buyers can save an additional $500. Visit toyotafinancial.com for program details. ALL OFFERS: Cannot be combined with other offers. Finance and lease offers available to well-qualified customers with Top Tier credit, not all will qualify. $220 doc & title prep applies to all offers. Offers end 4/30/2019. 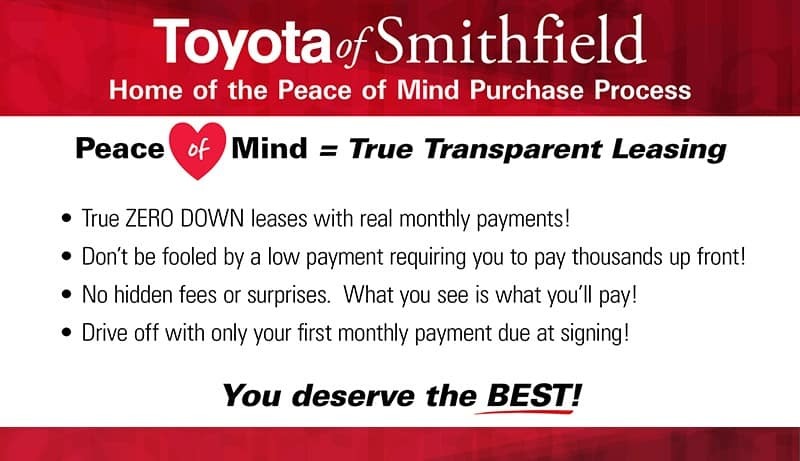 You don’t have to be on a strict budget in order to enjoy new car deals, because the benefits of zero down lease offers, low monthly payment options, and other financing specials are open to everyone in the Providence, Pawtucket, Cranston, RI, and Attleboro, MA area. We make it our mission to offer drivers from all over Rhode Island a place to find the latest models, like Toyota Camry, Corolla, RAV4, and Tacoma, and the new car specials to make the purchase more satisfying. If you have any questions regarding these specials and lease deals, be sure to contact our staff. One important thing to note is that these specials are changing frequently to provide you with the latest deals and the best options for your current situation, so it is important that you take advantage of the special offer right away. These new car deals won’t be around forever, and to use one of these offers, simply print out the one that best applies to you and present it when you are ready to purchase the vehicle of your dreams. Be sure to check the expiration date so you can ensure your lease special or new car deal isn’t going to expire before you get the opportunity to use it. When you are in search of the right vehicle, it helps to know that there are offers available to you that make affording it even easier than before. 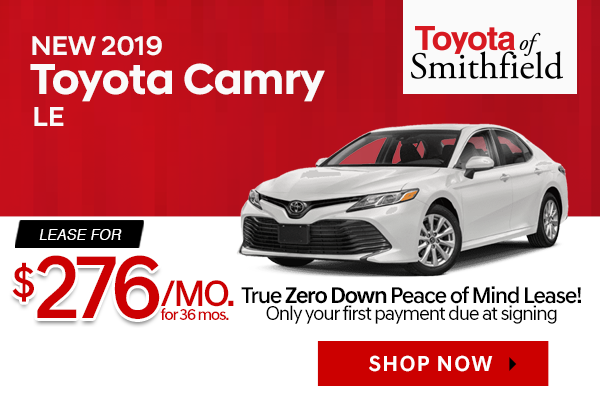 Browse our full inventory of new Toyota vehicles and contact our staff here at Toyota of Smithfield when it is time for a test drive. Once you have found the right vehicle, we can help you find the right financial fit with help from these new car specials. Here we offer more than a great place to purchase your dream vehicle, so visit us to discover the other services we offer to all Providence, Pawtucket, Cranston, RI, and Attleboro, MA area customers. Not responsible for typographical errors or changes to manufacturer incentives.